NEW! Upper Quadrant Corrugated 4mm signal transfers including LNE shunt, disc and spectacle plates! The Scotswood (Newcastle) to Redbank (Manchester) Newspaper train was generally double-headed, and made its way through Hall Royd in the late afternoon. There were two outward (loaded) trains to Newcastle that left Manchester as the papers came off the presses. There were also newspaper trains to various other key regional centres. Once unloaded, the empties were remarshalled into one long train of 20+ vans. These would typically be the bogie variety (BGs, GUVs) and the long-wheel based 4-wheel variety (CCTs, etc) but not - as often occurred in parcel workings - the 10-foot wheel base 'brown' vans. David Hay notes on his excellent Website that the train was originally worked by two Newton Heath locos, but this later became one Newton Heath and one York engine. At a still later date it was worked by two York locos, usually a pair of 'Black 5s' and sometimes a pair of B1s (although I have seen no photos of this particular combination). Apparently York would use a Doncaster, Darlington or Darnall-based B1, and very occasionally a B16 or even a V2. David suggests that on the Tuesday after a Bank Holiday weekend a Bristol Jubilee would often be used. On Sundays it was worked by a Farnley Junction loco plus one from Patricroft most of the time, whereas on Saturdays for a period towards the end of steam, a Carlisle Britannia or rebuilt Patriot was one of the pair. A Crab could also appear. There are photographs showing a single loco working the vans, and there are photos of an individual 8F and a BR 9F, as well as a Peak. David Hall on the Facebook 'A tribute to the L.M.S' notes: "When we worked it in the 60's at Mirfield the leading loco was a York loco,and we worked back from Rochdale with [the] same loco on a York parcel train as far as Mirfield." Dave Wilson of the same group added: "if memory serves we travelled home passenger from Exchange", Dave having rode out with the train and with 45581, as a cleaner at Farnley Junction in 1962. Steam was still in charge in 1965 as here is a photo taken by E. F. Bentley showing Black 5s 45062 (9J Agecroft) + an unknown class member passing Hall Royd Junction with the empty vans at 17.30 on Saturday 28 August 1965. Again, photographs also show a Class 40 piloting a Black 5. Once steam was ousted thereafter a Class 40 normally worked the empties, although 45s and 47s occasionally turned up. The odd thing about a '40' piloting a Black 5 is that soon afterwards a single '40' would be rostered, as her in Alan Sheridan's photo of the train close to its destination. The other trend worth noting is how the fleet of vans became more uniform as time went on. In 1963 just about any dedicated four-wheel covered carriage truck on the network could appear, and in particular both Southern both four-wheelers and bogie vans seemed popular. However as the sixties progressed BR GUVs, CCTs and Mark 1 BGs became the dominant vehicles, as the older vehicles - many with wooden bodies - were scrapped. 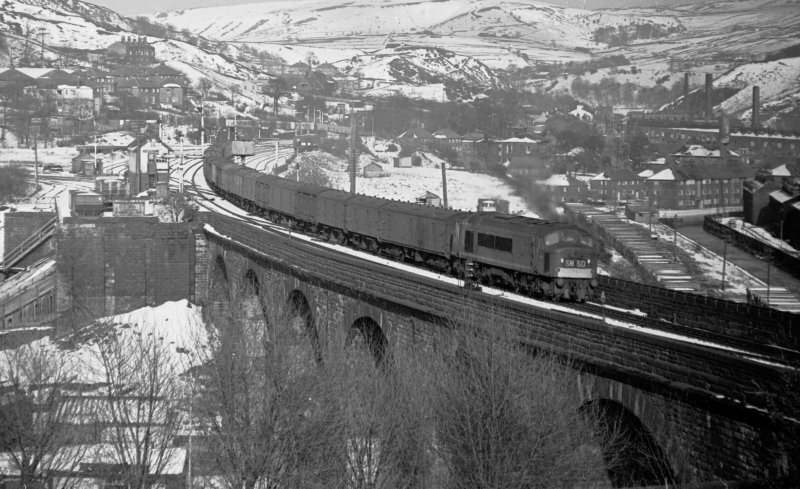 This wonderful shot, again by Eric Bentley, shows empty newspaper vans from Newcastle for Manchester Red Bank heading through Todmorden on Sunday 3 April 1966 at 17:30 hauled by Class 45 Peak D81. The last steam hauled train was just a couple of weeks later, and was recorded by Richard Greenwood in Volume 25 of the 'Steam World' series: thereafter the train was exclusively in the hands of a single 'Peak' diesel. The train had left Newcastle at 11.50 hrs. Note that most of the vans in the front half of the train are of the 4-wheel CCT variety, with the wooden Southern variety mixed in with its BR equivalent. The lead vehicle is the bogie GUV version. At this stage the infrastructure is still largely intact, with a coal hopper present on the coal drops to the left of Todmorden East signal box. The Up (Manchester-bound) is still in place. complete with its signals and siding about half way along. There appear to be two bogie coaches at the end of this siding, which in a fleeting film clip are possibly two LMS Period II vehicles. 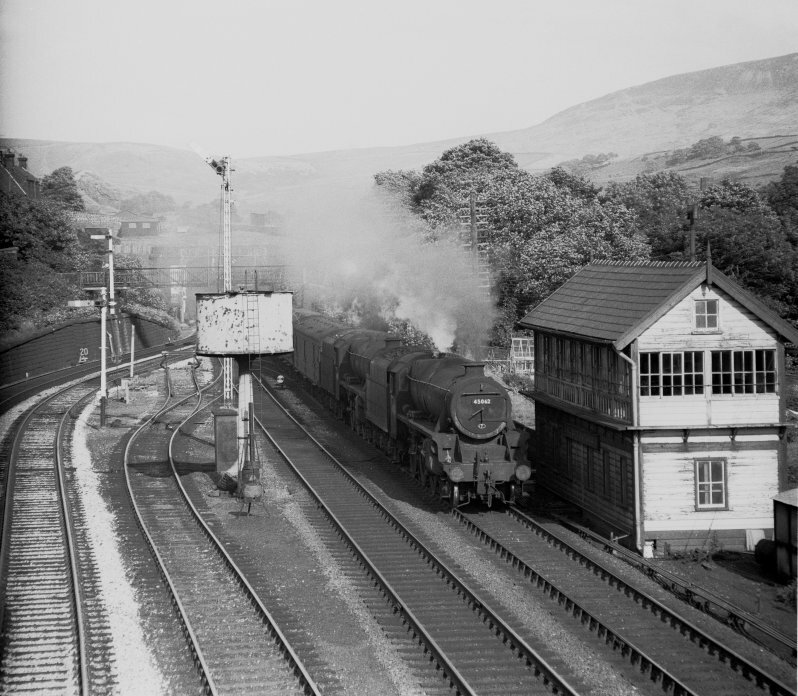 This is the only photo so far located showing a Peak at Todmorden during the steam-era. Post-1968 they were fairly regular visitors, primarily on freight and parcels workings. 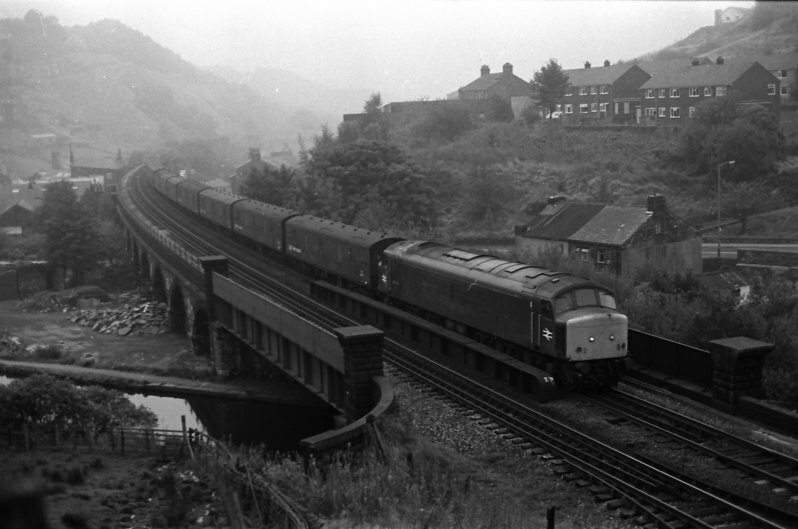 The end finally came in 25 June 1988, and there is a photo of this working with ersatz GWR green class 47 47628 'Sir Daniel Gooch' towing a rake of BR GUVs on the back cover 'Halifax and the Calder Valley' in the Railway Memories series by Bellcode Books. The timing of the train does appear to have varied almost year-by-year. Again in 'Halifax and the Calder Valley' on page 57 there is a photo taken at 17:16 at Elland Station on 26 April 1963 of 44895 and 42943 "heading the 09:31 am Newcastle-Red Bank vans". This would translate to about 17:30 at Hall Royd Junction which tallies with the note on the 1965 Bentley photo. My working timetables are from 6 March 1967 remarkably do NOT show the Red Bank train at all, so it has to be assumed that for some reason in this year it was put through Standedge. However by May 1971 it is shown as 5M48, timed to leave Heaton Carriage Sidings at 08:55, and passing Hall Royd at 16:53, having stopped for one minute at Henley (sic) Mills at 16:13. Peak Class 45 45130 crosses Gauxholme Viaduct with the empty Red Bank parcels train returning to Manchester on 28 September 1983. In 1981 the train was running as 5M48, departing Heaton at 05.40. David Allen & C J Woolstenholmes in their 'A pictorial survey of London Midland Signalling' note that the "once extensive newspaper traffic ceased completely in July 1988 following the decisions of News International (The Times, The Sunday Times, The News of the World and The Sun) and Mirror Group Newspapers to change to road distribution. The combined traffic had been worth £14 million to BR." By way of complete contrast, the 1967 tables does show 3M05, the 17:55 ex-Halifax, booked at Hebden Bridge for 18:38 and Todmorden for 18:46 before terminating Rochdale at 19:06. In contrast to what had hurtled through an hour before, this was latterly the preserve of Low Moor's last Stanier 2-6-4T 42616, often with a single BG. Creating the train in model form quickly showed up the deficiencies in my existing stock. I thought I'd been collecting suitable vehicles for some time and assumed I could create the train without having to buy any additional vehicles. From studying photographs it is apparent that in the 50s it was formed of a pretty random collection of bogie and 4-wheeled from a range of sources, including the Southern, Western and Eastern regions: the Southern 4-wheeled CCTs being prominent in one 9F hauled train. But as the 60s progressed more of the BR bogie CCTs and BGs started to appear, and prior to its demise in the 1980s the train was formed entirely with BT Mark 1 CCTs.